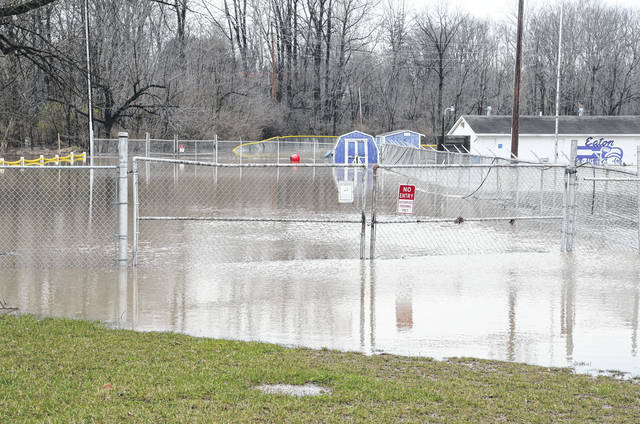 Pictured, flooding at Park Avenue Field in Eaton was severe on Tuesday, April 3. Other areas around Preble County also remained under water. 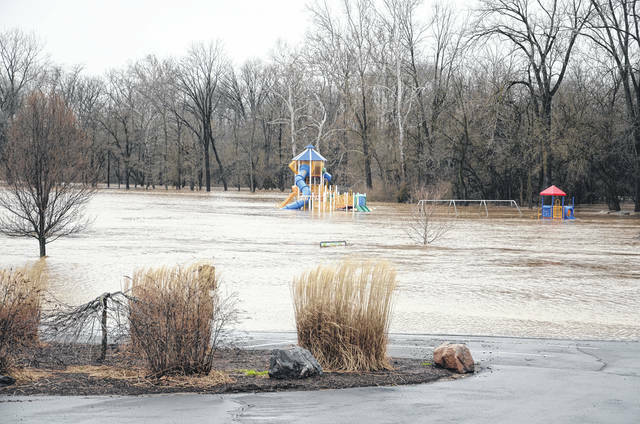 Seven Mile Park, Water Works Park and Hook Park in the city of Eaton are all closed until further notice due to high water. Road closed signs were familiar to those driving in the county on Tuesday, April 3, as storms flooded several roads and fields. 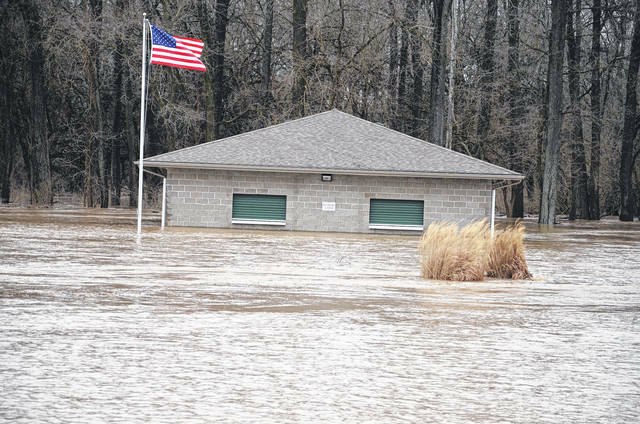 Seven Mile Park in Eaton was under water on Tuesday, April 3, after storms pounded the entire county and region. 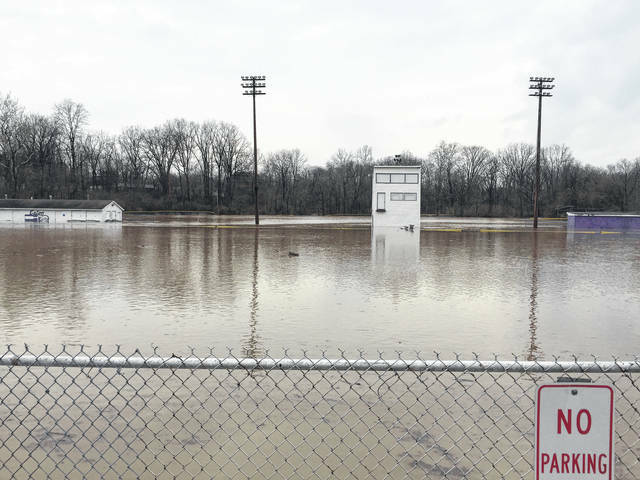 Several other parks, fields and roads were also underwater through out the county as well. 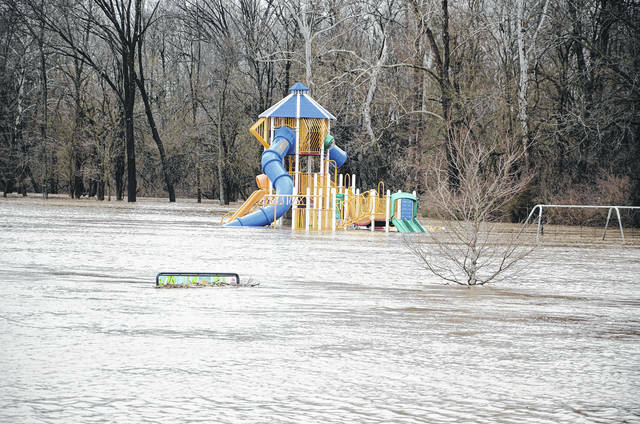 PREBLE COUNTY — Flooding caused by heavy rainfall closed roads and made travel treacherous in parts of the county on Tuesday, April 3, and at press time, many parks and areas remained closed. According to National Weather Service reports, Camden residents saw hail up to an inch in diameter. Rainfall totals were around 3 inches in many areas. Severe storms and flooding weren’t the only weather events Tuesday April 3-Wednesday, April 4. Ohio also had four confirmed tornadoes, one north of Xenia, one near Selma, one in Grove City and one near London. 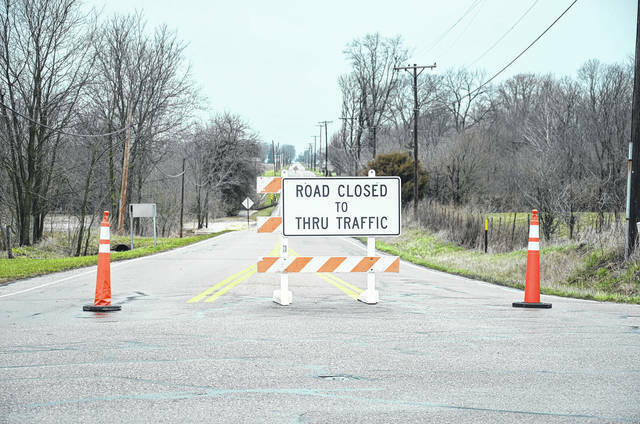 Preble County Engineer Kyle Cross announced numerous road closings on Tuesday, April 3, due to high water and flooding. Washington-Jackson Road was closed between Eaton-Gettysburg Road and U.S. 35 for flooding. It was to remain closed until the water receded. Lexington Road was closed between Washington Twin Road and Wysong Road due to flooding, to remain closed until the water receded. Consolidated Road was also closed between Wayne Trace Road and U.S. 127 due to high water. According to the National Weather Service in Wilmington, flash flood warnings, severe thunderstorm warnings, and tornado watches were in place on Tuesday afternoon. High winds, large hail and torrential rains moved through various parts of Preble County. Severe thunderstorms and heavy winds continued through Tuesday evening, and with temperatures dropping into the 30s, snow showers were back on Wednesday, April 4. Thursday was mostly sunny, with temperatures hitting the mid-40s, before possible showers Thursday night. Friday’s forecast called for mostly cloudy conditions with a 30 percent chance of rain, before a low temperature of 25 degrees was predicted to cause a changeover to snow Friday night into Saturday. Additional chances for snow are possible Sunday, April 8 and Monday, April 9. 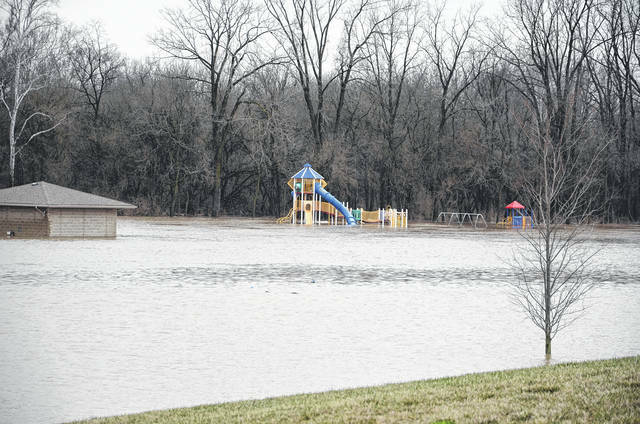 Seven Mile Park, Water Works Park and Hook Park in the city of Eaton were all closed until further notice due to high water. Anyone having any questions about road closures should call the engineer’s office at 937-456-4600.